Pierre-Eugene Montézin was born in 1874 in the very heart of Paris. His father was both an artisan and an artist as he created designs for lace. He was, in addition, a lover of nature who took his young son on expeditions to the country. For Pierre, accompanying his father in the early morning through the still countryside and long riverside paths, a deep communion was established with the beauty of real nature. Later when he was an artist, he was to welcome in his work the farmers who live and work in the fields, making them a part of his picture. He shows us real people working under the sun on farms which Montézin painted between curtains of trees, under the light Ile-de-France skies reflected in the slowly moving rivers. In 1893 Montézin made up his mind to gain acceptance in the Salon. For ten years he painted ceaselessly and sent his work to the Salon, and was regularly turned down. At last, he was accepted in 1903. He was still a young painter, but now he was esteemed and appreciated by the great public. When war broke out in 1914, Montézin enlisted and fought at the front, receiving the Médaille Militaire after the battles of the Meuse. At the end of the war, he returned to Paris and resumed painting. Montézin spent very little time in his studio; he could really work only from nature. Honors began to come to Montézin as early as 1920 when he received the Rosa Bonheur Prize. In 1923 he was named a Chevalier of the Legion of Art. In 1932 he obtained the Medal of Honor at the Salon des Artistes Français. Critical reaction to this nomination was explosive. 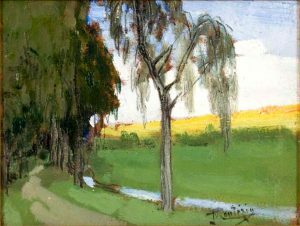 For thirty years no landscape had received the Medal of Honor which, since 1897, had been awarded only to figure painters and painters of compositions. For three decades landscapes had been considered a minor form of painting, a fact which made Montèzin’s triumph all the more real. In 1932 the painters of the Salon unanimously elected Montèzin president of the Salon jury. The same year he had a great exhibition in Paris to which the public flocked. 237 canvases were shown, all landscapes full of poetry. All the charms of the Ile-de-France were displayed before the eyes of an admiring urban population. Similar successful exhibitions in Paris followed in 1936, 1938 and 1943. 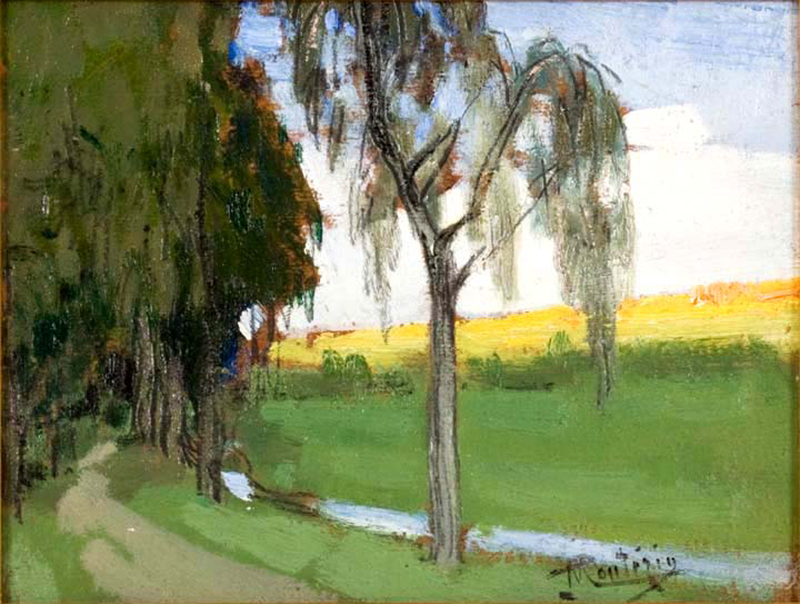 Montèzin painted to the end of his long life, dying suddenly in 1946 while he was painting during a trip to Brittany.